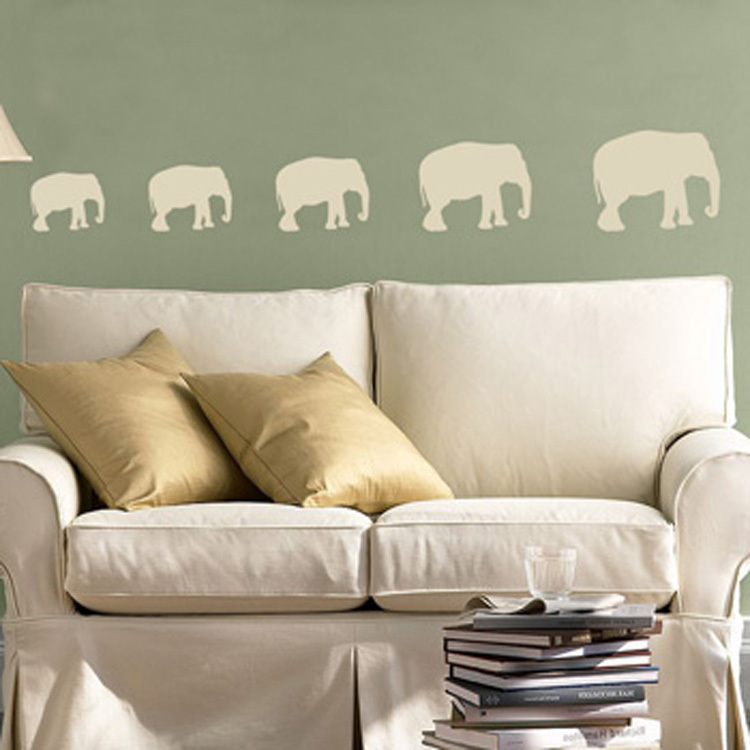 We love our set of 5 elephant wall decals, all lined up and marching in a row! These awesome elephant wall stickers are ideal for an entrance, foyer, garage door, laundry room, nursery, bedroom, dorm, apartment, office, your child's space, or anywhere with a smooth, flat surface! Our elephants measure 60 inches wide by 9 inches high, as shown lined up. You can order an additional set at a discounted price, too! Our elephants come all together on one sheet. Just cut apart before installation! I am so pleased with the way my order turned out! It looks fabulous. DaliDecals did a wonderful job and expedited my order quickly...I would recommend them to anyone! I do not, never will, have a artistic bone in my body, yet I was able to put up a large formula one personalized race car in my son's room .....BY MYSELF. The decal is awesome. It looks like it is painted on his wall. The instructions were excellent and if I can do it, ANYONE can! We love Dali Decals! We designed our own quote decal to hang on the wall behind the head table at our wedding, since we were not allowed to permanantly "attach" anything to the wall. We added daisy decals in our wedding colors (orange and green) around the quote. It looked so beautiful - like the wall had been painted to our specifications! Took us just a little while to figure out how to hang them, but once we got the hang of it, it went really quickly - and they came off the wall without any damage to the paint AT ALL. We will definitely be using Dali Decals again! I just received my "I'll love you forever quote" and I love it!! I purchased a couple others from Etsy and their quality doesn't compare to yours!! With those other decal companies, I had a hard time getting the decals to go onto the transfer paper and it was very frustrating!! When your decal arrived I was dreading putting it up, but it was so easy and didn't take long at all!! I'll definitely be purchasing more from your site and your site only!! Thank You for helping us decorate the perfect room for our foster to adopt baby girl! !